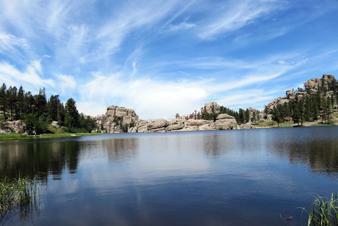 Visitors to the Black Hills of South Dakota often head there simply for the experience of Custer State Park camping. The beauty of the landscape alone is worth the trip. Learn more about the many camping options within this popular state park. 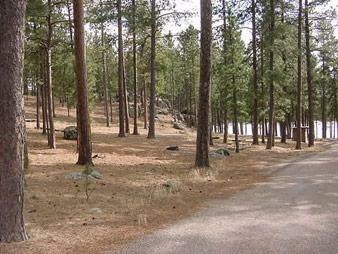 Custer State Park encompasses approximately 71,000 breathtaking acres. Visitors come just to experience the amazing landscapes, lush forests, and fascinating wildlife. Recreational activities include camping, hiking, mountain biking, fishing, rock climbing, horseback riding, and more. Blue Bell Campground - Featuring approximately 35 campsites, this campground also has a common area that includes dining and meeting rooms, toilets, and showers. In addition to the campsites that are available, over 20 cabins can be reserved. Center Lake Campground - The largest campground in the park, Center Lake Campground features approximately 71 available campsites, all within an hour or two of major Black Hills tourist sites, including Crazy Horse, Wind Cave, Mount Rushmore, and more. Center Lake is the only campground that does not offer flush toilets. Grace Coolidge Campground - Fishing enthusiasts love camping at the Grace Coolidge Campground where they can fish in the walk-in fishing area and shop at Coolidge General Store. Game Lodge Campground - Another large campground, Game Lodge Campground offers approximately 59 campsites for visitors to enjoy. Amenities include toilets, sewage facilities, and showers, and a full-service restaurant is located nearby at the State Game Lodge & Resort. Popular nearby activities include mountain bike rentals, buffalo rides, and of course miles and miles of hiking trails. Sylvan Lake Camp - With 39 campsites located near the pristine Sylvan Lake, this campsite is the perfect haven for outdoor enthusiasts who enjoy water sports, hiking, rock climbing, and more. Stockade Lake North Campground - Featuring approximately 43 campsites located on the park's west side, campers who stay at Stockade Lake North Campground enjoy fishing, boating, and hiking opportunities all within a quarter mile of the campground. If you are planning to visit the park, you will need to know details about campground policies and activities. Camping fees are collected daily and are based on the number of camping units reserved. Firewood may be purchased at any of the Custer State Park's convenience stores or resort areas, but wood may not be brought from outside the park. Evening campground programs are often held throughout the summer with listings posted on the bulletin boards in each campground. 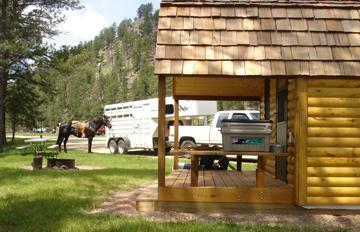 Campsites at each Custer State Park campground include a picnic table, fire grate, and gravel or paved camp pad. Non-profit youth camping areas are located at Center Lake and Shady Rest campgrounds. These campgrounds are designed specifically to accommodate youth groups like Boy Scouts, Girl Scouts and church youth groups. Horse enthusiasts will enjoy visiting the French Creek Horse Camp, a campground specifically created for campers who want to bring their horses along. Camping groups can find accommodations at one of two campgrounds in the park - Stockade Lake and Game Lodge. 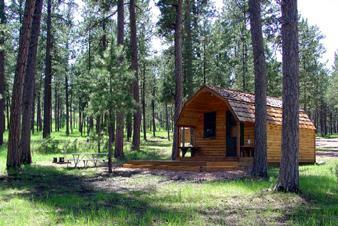 In addition to the above campsites, many of the campgrounds feature one-room, log-style cabins. These can be found at a select number of campgrounds, including Blue Bell, Game Lodge, French Creek Horse Camp, and Stockade South. If you are looking for a more primitive camping experience, check out the French Creek Natural Area accessed by backpacking into the canyon. 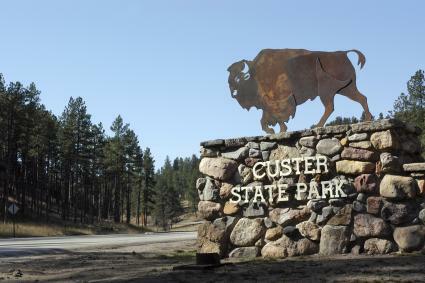 For more information or to make reservations at any one of the Custer State Park campgrounds, call 1-800-710-2267 or visit the South Dakota Game, Fish, and Parks website.